The first article introduces the studies on the substitutes of tiger bone. The U.S. Congress passed the bill Prohibition of import and sales of tiger and rhino parts right after the special report about the tiger conservation activities in the Chinese Community in San Francisco was published. 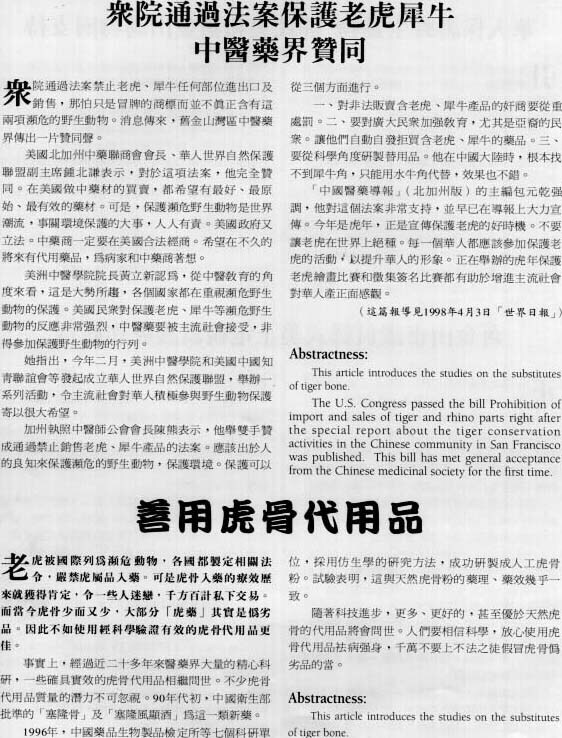 This bill has met general acceptance from the Chinese medicinal society for the first time. The second article introduces the studies on the substitutes of tiger bone. Previous article : Ms. Mabel Teng and San Francisco Zoo showing support to Tiger Conservation. KPST66 TV Station Showing support to Tiger Conservation. Next article : The Tiger Awareness Day Fair.